Mixing foundations is something I have never done, I seem to always strike lucky with the right shade and can adapt to the formula of the foundation. Until recently. 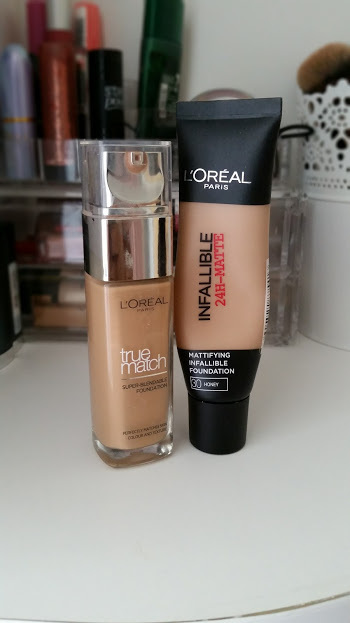 I saw the lovely Taylor post on instagram about her favourite foundation combination at the moment, that consists of the l'Oreal true match and the Infallible. After hearing her thoughts I knew I had to try it out to see the results. Low and behold the girl has done it again and has created a super foundation. When you mix them both together you are infact mixing the properties of each one, the True Match is light weight, medium coverage and gives a dewy finish whereas the Infallible is high coverage, sometimes too heavy for everyday and matte. When you put these together you have a foundation that is high enough coverage for a flawless face, a semi-matte finish that looks incredible and coverage that lasts all day. I have slightly fallen in love with mixing these both together, and it comes at the right time seen as though both of them need finishing up. If you like both of these foundation on their own, then I suggest trying to mix it up by putting them together because you are creating the perfect foundation. It isn't something I would do just for a quick trip to the supermarket but for a long day at work or school this is great.